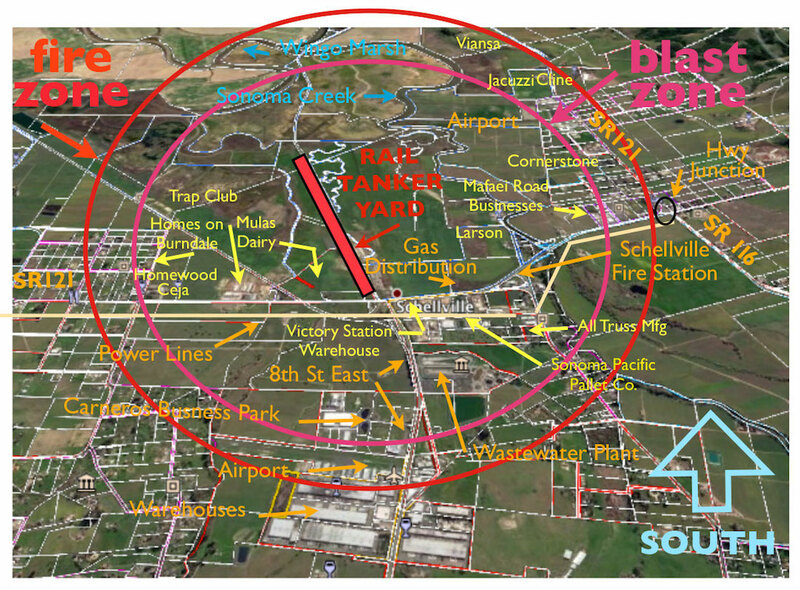 All of the locations and services listed below are either within the blast zone, or are in the secondary zone in which blast- and wind-driven flames are likely to set buildings and services alight. Click on the map to see who is affected. Schellville Fire Station – first-responder fire and disaster response station. 8th Street Wastewater Treatment Plant – service interruption would leave 12,000 residences & businesses without services, 22,000 people in danger of evacuation. PG&E power lines – service interruption to 20,000 people at the south end of the Sonoma Valley. PG&E gas distribution station – newly installed regional natural gas switching station. Railroad’s own staging site –long-term interruption of regional freight rail transit. Schellville Airport –the primary emergency air-transport evacuation location in a disaster. Private businesses: all lie within the blast zone or the impact zone subject to fire. Mulas Dairy, award winning dairy, 850 dairy cows, residences & processing buildings, hayfields vital to the business, etc. Carneros Business Park – 153 acres, includes Chanel Cheese, Ganau America Cork, etc. Homes on Burndale south of 121 – more than 30 homes with values in excess of $1M. Homewood Winery – popular small winery on Burndale Road. Businesses on Maffei Road – variety of small businesses essential to local agriculture. Cornerstone – wineries & local shops, Sunset Magazine, businesses, tourism destination and site of many events with large attendance, local and from the Bay Area. Jacuzzi Winery – premium winery & event center, site of many weddings. Valley of The Moon Trap Club – sports & recreation venue, the “last of the small hunt clubs”. Regional services: all would be out of service or heavily impacted after a “bleve” explosion. SR 37 – heavy traffic loads and long delays caused by diversions due to road closure. SR 80 – additional traffic loads due to closure of east-west cross Sonoma traffic flow. SR 101 – additional traffic from diversions due to road closures on SR 37 and 121. Surrounding communities of Sonoma and the Sonoma Valley – congestion and traffic delays would be widespread due to the loss of transportation corridors and evacuations caused by fires and the loss of wastewater treatment services.